One of my favorite Christmas gifts this year was the Cucina Pro Crepe maker from my hubby. Only $40 at Amazon, and worth every penny. My friend had introduced me to the wonder of crepes last year, but I was on the fence for buying one. So, I put it on my wish list. Lots of my gifts this year seemed to be things I want but wouldn’t buy for myself – that strategy worked pretty well. Anyhow, the whole family is loving this new appliance. Just take a look at the results – yep, I made that lovely crepe in my very own kitchen! See below for the recipe – I’ve made 3 batches since Christmas Day. 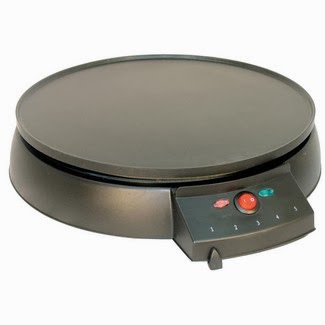 Here’s what the crepe maker looks like. And it comes with that cool little wooden rake. Yes, you can make crepes without the electric maker; however, the ability to have even heating makes a big difference in the results. It’s easy to clean up, too. Make up the batter (see recipe below) and let it sit for 30 minutes prior to starting your crepe making. Melt butter and spread it on the griddle surface between each crepe. Separate the crepes with sheets of wax paper or paper towels as you cook. Make up more crepes than you think you need – they store well in the fridge for a few days, and you can heat them easily in the microwave. My favorite toppings include: Nutella alone or with Bananas and/or Strawberries, Blueberries and whipped cream. Or, fold them in half and sprinkle with powdered sugar or cinnamon sugar. Here’s the recipe that I use (thanks Parissa!). This makes about a dozen or so crepes. Measure all ingredients and combine in large bowl. The batter shouldn’t have lumps. I use one of those wand mixers or immersion hand mixers right in the bowl. You could probably use a blender, food processor or stand mixer. Whatever you need to get the batter to the consistency of heavy cream. Let mix stand on counter for 30 minutes – I don’t know why, but it works. I like to pour the batter from a large mixing cup onto the surface of the griddle. They don’t take long to cook- maybe a minute each? Flip them with a silicone turner when the top starts to look dry. That’s it – top (or not) and enjoy. Please leave me a comment below if you have a favorite crepe tip or topping.